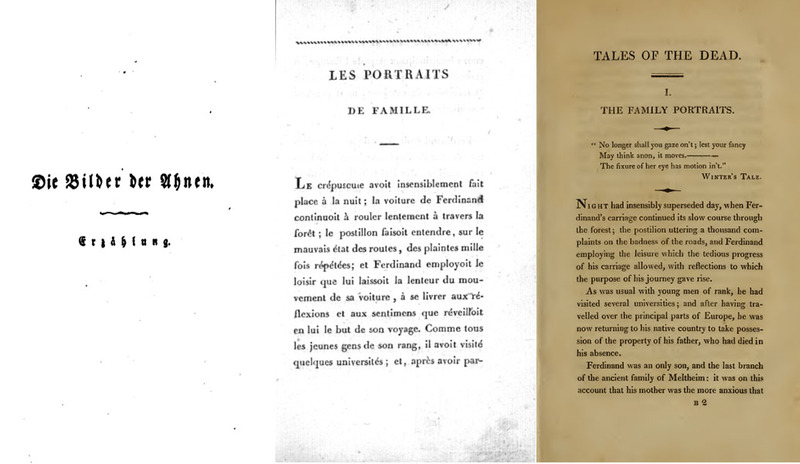 As noted in my previous blogs on Frankenstein and Fantasmagoriana, the first story read by the Byron-Shelley circle on that stormy night in June 1816, ‘L’Amour muet’, was not as influential and well-known as the second story, ‘Les Portraits de famille’ / ‘The Family Portraits’. Mary Shelley herself stated that ‘Les Portraits de famille’ was a direct influence on the composition of her famous novel. So, let’s take a closer look at the details of this inspirational ghost story! While ‘The Family Portraits‘ opens Utterson’s Tales of the Dead, it is actually the second story in Fantasmagoriana. For the past two-hundred years, the German source for the story had largely remained unidentified. 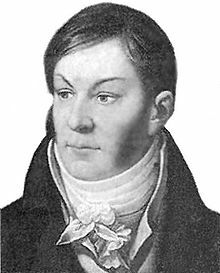 Only recently has Johann August Apel (1771–1816)—one of the co-authors of Gespensterbuch——been traced as the author of ‘Die Bilder der Ahnen’ [trans. The Pictures of Ancestors]. Apel’s original story runs 97 pages. Likewise, Eyries’ French translation is 108 pages long. At 60 pages, Utterson’s English translation appears to be slightly curtailed. Moreover, Utterson adds a Shakespearean epigraph framing the narrative. The epigraph is an amalgamation of lines spoken by Paulina and Leontes in The Winter’s Tale (V. iii. 60–61; 67). Clearly, Utterson is targeting her English readers in citing a play familiar to her audience and thematically playing on the gaze of the portraits fixed upon their viewers in Apel’s story. ‘The Family Portraits’ has several plot twists as new details and vital information change the relationships between characters. A brief chronological reconstruction will suffice in highlighting the main elements. The plot revolves around the ancestors and descendants of three ancient families: the houses of Meltheim, Hainthal and Wartbourg. The protagonist is Ferdinand of Meltheim, who is destined by his mother to marry Clotilde of Hainthal. Ferdinand, however, desires to marry the love of his youth, Emily of Wartbourg. Their happiness is inextricably tied to the deeds of their ancestors. The ancestral curse centres on the founder of his race, Ditmar of Wartbourg who committed a terrible crime. The portraits of Ditmar, and his former fiancée, Bertha de Hainthal, are active agents in causing the deaths of some of their descendants. In one instance Bertha’s portrait falls from above and kills Ferdinand’s sister, Juliana of Meltheim. The spectre of Ditmar haunts the Wartbourg family, kissing two young male descendants in their sleep, who both promptly die three days later. The plot unravels the ancestral curse through the telling of ghost stories; death-bed secrets; the discovery of a parchment hidden behind a portrait; and Ditmar’s will sealed in ‘an iron chest, which had not been opened for nearly a thousand years’ (49). The story ends with the breaking of the curses; the marriage of Ferdinand of Meltheim to Emily of Wartbourg, and; the fading of Ditmar’s portrait. This is the main plot of Utterson’s ‘The Family Portraits’. The influence of ‘Les Portraits de famille’ on Frankenstein has become part of the legend of the ghost-storytelling contest. Ken Russell’s movie Gothic (1986) directly interweaves the Ditmar visitation of his young descendants in ‘The Family Portraits’ with the Byron–Shelley circle reading of the story (see minute: 19.40–22.00); adding such strange details as leeches covering Ditmar’s face (see also minute: 22.45–24.00). Mary Shelley herself vividly recalls these scenes in her 1831 introduction to Frankenstein. On a sudden I perceive, in a spot of the avenue less dark than the rest, the same figure represented in the formidable picture, enveloped in the grey mantle I so well knew. It advanced towards the château, as if hesitating: no noise was heard of its footsteps on the pavement; it passed before my window without looking up, and gained a back door which led to the apartments in the colonnade of the château. ‘I was petrified with horror, and dared neither move nor shut my eyes. I beheld the spectre stoop towards the child and softly kiss his forehead: he then went round the bed, and kissed the forehead of the other boy. <<Soudain j’aperçus dans un endroit de l’allée, plus éclairé que les autres, la figure don’t le portrait repreésentoit les traits formidables, enveloppée du manteau gris qui m’étois si connu; elle s’avonçoit vers le château, comme en hesitant. Aucun bruit ne dècéloit sa march sur le sol pierreux; elle passa devant ma fenêtre sans y jeter les yeux, et gagna une porte latérale qui menoit aux appartements de la façade du château. <<Le saisissement, l’horreur me glacèrent; je n’osai ni remuer, ni meme fermer les yeux. Je vis le spectre se pencher vers l’enfant, et lui baiser doucement le front. Il se pencha ensuite par dessus mon lit, et baisa le front de l’autre enfant. <<Ce n’ètoit donc pas un rêve, unce chimère, fruit d’une imagination exaltèe! Un messager mystèrieux, infaillible, sorti du monde surnaturel, avoit passé auprès de lui, s’ étoit placé près de sa couche, et par son baiser fatal avoit insinué le germe de la mort dans le sein des deux enfans. Clearly, the scene in which Ditmar curses his descendants to death with a kiss had a profound impact on Shelley. Terry Hale reminds us that ‘The Family Portraits’ ‘offers one close parallel with Mary Shelley’s novel in that both works deal with the annihilation of an entire family’ (Tales of the Dead. The Ghost Stories of the Villa Diodati, 16). The concept of the ancestor’s deeds cursing his descendants is well characterised in Frankenstein’s first victim, William, who like the boys in ‘The Family Portraits’ is young and innocent—an ‘infant darling’ (Frankenstein, 99). This concept is also evident in Victor’s doomed relationship with Elizabeth. In ‘The Family Portraits’, Ferdinand’s sister is cursed from marrying her betrothed when an ancestral portrait falls on her and causes her death. Likewise, a curse haunts Victor in causing Elizabeth’s death thus precluding their marriage. These plot and curse elements in the ghost story were clearly an influence on the composition of Frankenstein. Next: the third story in Fantasmagoriana: ‘La Tête de mort’ / ‘The Death’s Head’!